Andy Pettitte pitched a gem against the Red Sox last night, but was slammed with the no-decision for the eighth time in 23 starts this season. He has lowered his ERA from 4.85 to 4.14 in his last five starts and has one win to show for it, giving him nine on the year. 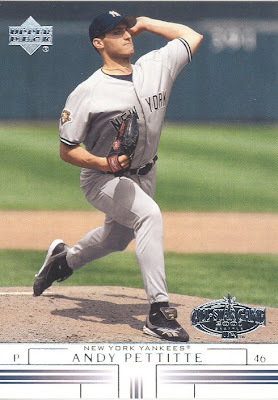 This is a 2001 Upper Deck common card of Pettitte. Notice the All-Star Game symbol in the lower-right corner, as it was his second selection to the Midsummer Classic that season. Pettitte pitched a scoreless fourth inning in the AL’s 4-1 win in the All-Star Game. Pettitte is outperforming expectations, and is doing so in a desperate situation with the usually dependable Chien-Ming Wang absent from the rotation for most of the season. Pettitte would love to finish the year with an ERA around 4.00, which would be a half a run improvement from last season.